The Hollywood Bowl is one of the most historical and wonderful outdoor venue’s in the area. It’s incredible story makes it even more appealing to visit and feel a part of a concert or event as it has a very nostalgic feel. Set in a stunning backdrop of nature, it is quite literally been carved into a hillside with a shell-like exterior. Back in it’s early beginnings, the arches were first built in 1929. And it wasn’t until 2004 when they were made bigger, giving the venue it’s distinctive bowl shape that can be seen today. If you are a true music fan then you will know that good sound is everything. Due to the creative design at the Bowl, the acoustics are just phenomenal – making every performance feel that more up close and personal. Hollywood is of course world-famous for it’s influence within the creative scenes, particularly within Film and the same goes for Music, showcasing the highest standards and the hottest talent around! 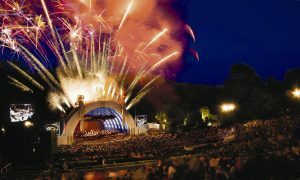 Why not catch an exciting and unforgettable live performance at the Hollywood Bowl this year!